Diabetes remains the most common reason for nontraumatic amputation in the USA. Diabetic amputations and complications from diabetes kills more people then some cancers. 5 year mortality rate after a leg amputation is depressing at close to 50% in some studies. People don't realise this until it is way too late. If you have been diagnosed with diabetes you must see a podiatrist on a regular basis as well as do daily foot checks by yourself or a family member. Few reasons why diabetics are at high risk for foot problems. Lack of feeling on the bottom of the feet, you can't feel if you have a blister or ulcer that would stop most people to check. Peripheral arterial disease (PAD): diabetics tend to have higher rate of arterial insufficiency or decrease in blood flow. That lack of blood flow inhibits healing of the wound. Glycosylation of muscle, sugar coating muscle cells causing stiffness of the calf muscle and cause contractures. Same way a hemoglobin can be sugar coated hence the HBA1C test that is done to assess diabetic control. Ways to increase your odds of keeping your toes, feet, legs. Visit a DPM every 6 months for low risk or every 3 months for moderate to high risk. Always get fitted for shoes, measured by your podiatrist or pedorthist do not wear open toed shoes. Some diabetic amputations are preventable with proper preventative care and observation by a podiatrist. Save your limb or a loved one's. 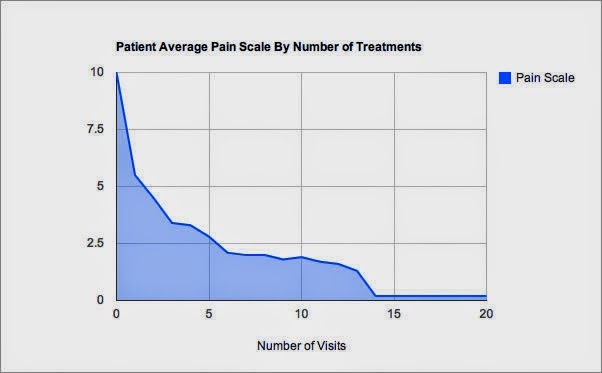 As you can see from above at visit / treatment #14 the pain scale goes from a 10 to less then a 1. This is an awesome result given that up until now there have been very little choice besides medications.